plastic « Global Market Insights, Inc. The global outdoor furniture market has experienced a noteworthy upsurge in the last few years, chiefly influenced by an improvement in the standards of living. The industry trends have also undergone a change of dynamics on account of the availability of countless furnishing options and burgeoning expenditure on exterior decor, especially by urban population. With the surging popularity of outdoor living spaces, the concept of outdoor housing has ascended as a prominent trend. Without a doubt, the outdoor homing trend has increased sales of outdoor furniture, especially patio furniture ranges. For example, nowadays spacious lounges and wide armchairs are a common choice for large patio furniture landscapes amid comfort-seekers. Another factor that is driving the commercialization fasciae of the market is the existence of multifarious furniture options in terms of designs and styles, which allows homeowners as well as interior decorators to impeccably give the desired appearance to the property. Even government-led initiatives to promote better usage of open spaces and high investments to adorn public spaces, parks, gardens, sports arenas, and other areas will further escalate outdoor furniture market demand. For instance, the Naples City Council has recently awarded a $10.6 Mn contract to Manhattan Construction to develop the long-awaited 15-acre park on the Gordon River, decked with features such as a planted hill, band stage, splendid seating, and a single-story flagship building. Outdoor furnishing in residential areas is aimed at creating a finely integrated, soothing, and cohesive space that not just looks astonishing but also functions excellently and augments the pleasure one gets out of the outdoor living area. Apparently, the residential segment emerged dominant in outdoor furniture market in 2017, with a share of 60%. Developed nations in North America and Europe are set to offer significant profit generation opportunities to global manufacturers owing to increasing per capita income, shifting lifestyle patterns, and the rising trend of organizing family get-together & dinners in home gardens. In addition to this, the growth in geriatric population will trigger demand for comfort-enhancing outdoor furniture products such as recliners, loungers, adjustable seats, and day beds. In general, there has been a surge in the willingness to spend on luxurious furniture items among homeowners which is adding impetus to the outdoor furniture market growth from residential applications. Outdoor furniture market growth from the commercial sector is projected to experience an upward trend in the coming years owing to burgeoning purchase by hospitality companies, business hubs, sports complexes, and municipal gardens. Commercial properties with gardens, pools, outdoor sitting spaces, open-air restaurants, and beaches are the vital revenue pockets of this market. Rising consumer spending on travel and tourism activities has given rise to growth opportunities for the hospitality and recreation industry, which has, in turn, benefitted the outdoor furniture demand from the commercial segment. Hotel consumers have started to impart importance to the ambience, as a result of which the number of sea-side restaurants, pool-side cafes, and terrace restaurants has increased multifold, consequently bolstering the growth of the outdoor furniture market from commercial applications. Danube Home, a leading home decoration company based in the Middle East, has recently introduced its exclusive Garden Collection 2019 during a launch ceremony in Salmabad, Bahrain. As a part of the garden range launch, a new 2018/19 catalogue was announced which features over 1,500 items, offering an all-inclusive guide for outdoor furniture, décor accessories, and lifestyle elements. The newest collection also encompasses a wide range of bold and vivacious products such as an all in one gazebo, furniture with lighting, convertible benches, an Arabic majlis, sofa with utility function (added table), wall fountain, modular collection, outdoor kitchen with BBQ, and much more. 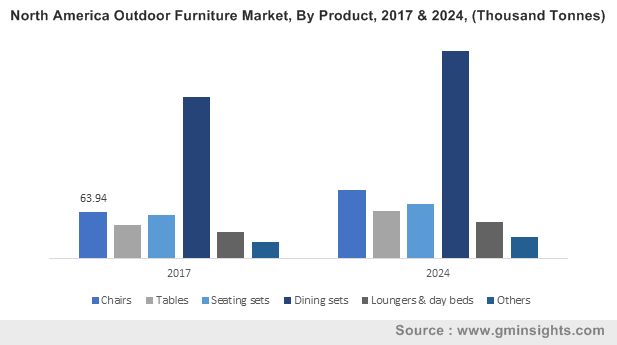 In view of the abovementioned factors, it is clearly visible that the global outdoor furniture market will emerge as the strong revenue pocket for the overall furniture industry. The growing inclination towards visually appealing as well as comforting landscape designs will spur the demand for outdoor furniture, thereby augmenting the industry trends in the years ahead. This entry was posted in HVAC and Construction and tagged APAC Outdoor Furniture Market, Canada Outdoor Furniture Market, Europe Outdoor Furniture Market, Global Outdoor Furniture Market, Metal, Outdoor Furniture Industry, Outdoor Furniture Industry analysis, Outdoor Furniture Market, Outdoor Furniture Market 2019, Outdoor Furniture Market 2024, Outdoor Furniture Market forecast, Outdoor Furniture Market growth, Outdoor Furniture Market Outlook, Outdoor Furniture Market PDF, Outdoor Furniture Market report, Outdoor Furniture Market share, Outdoor Furniture Market size, Outdoor Furniture Market statistics, Outdoor Furniture Market trends, plastic, Textile, U.S. Outdoor Furniture Market, Wood. The liquid nitrogen market has been continually expanding over the last few years, ever since nitrogen was first liquified in 1883 and its usage in industrial processes surfaced. 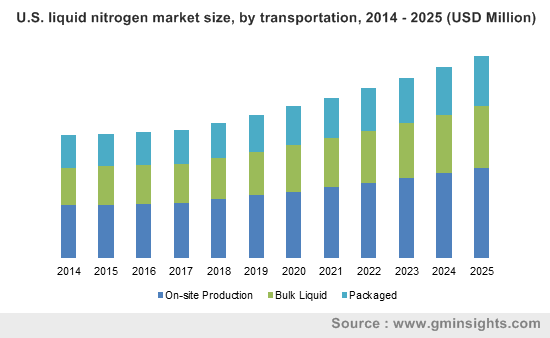 By 2025, the value of the liquid nitrogen market is estimated to be $17 billion, which does not come as a huge surprise, given the product’s deployment in the food, healthcare, manufacturing, oil and gas and various other sectors. In regions such as Europe and North America, the liquid nitrogen industry has reached maturation as the application of LN2 in these regions is much more widespread than in regions like Asia Pacific or South America where the liquid nitrogen market is gaining ground. How is the F&B sector contributing to the growth of liquid nitrogen market? The food industry is one of the major beneficiaries of the widespread usage of liquid nitrogen and the growth of food freezing over the past 30 years has in turn added to the growth of the overall liquid nitrogen market. The food industry utilizes two kinds of freezing namely cryogenic freezing where freezing is achieved with the use of liquid nitrogen and mechanical freezing, where foods are frozen using traditional freezing devices like spiral freezers, bed freezers etc. Cryogenic freezing has been garnering greater traction due to its lower capital costs and cheap production prices. Food companies have been able to lower their capital cost almost to zero while gaining large refrigeration capacity by renting cryogenic storage tanks from gas companies and buying liquid nitrogen as required. Leaders in the food industry have been relying on the usage of liquid nitrogen for the freezing of poultry, dairy, meats and bakery products as well as of microwave meals, pasta, fruits and vegetables as the rapid freezing of food items with liquid nitrogen has various marketable benefits. Liquid nitrogen prevents the formation of crystals on foods besides preventing oxygen from reaching the food surface thus curbing bacteria growth which needs oxygen to grow and multiply. Where mechanical freezers can cause dehydration of products cryogenic freezers can avoid any dehydration, which in turn provides producers with a better yield. As the advantages of using Cryogenic freezing become more apparent, the liquid nitrogen market is expected to record a significant growth through the food industry over the next few years. In the pharma industry, liquid nitrogen application has gained major headway especially with the use of the product in cryoablation, a process that destroys cancer cells through freezing. Cryoablation has gained momentum over other procedures like radiofrequency ablation in the electrophysiology market mainly because of the simplicity of the procedure as well as due to successful clinical trial results which have sowed that patients are faced with fewer post-procedural complications in cryoablation. Cryoablation is still a technology that can be said to be in its infancy with Medtronic being one of the only players in the cryoablation space of electrophysiology market. But recently Boston Scientific announced that it will be entering the cryoablation market as well which points that competition in the cryoablation as Boston Scientific has a much stronger portfolio. With other medical device and healthcare market players looking to expand their capabilities in early stage cancer treatment, it is predictable that liquid nitrogen market will register some major growth prospects through the increasing demand of the product in the medical space. For the liquid nitrogen market, the oil & gas industry is one of the most prominent end-use spaces. With a commendable boost in shale oil and gas sectors in recent years and spike in hydraulic fracturing, enhanced oil recovery, which greatly involves the use of nitrogen, has witnessed revived interest adding traction to the liquid nitrogen market. Powered by an increase in upstream activities include exploration and extraction, liquid nitrogen is among the industrial gas products used to enhance oil production rates and yields, while also lowering total costs. Many of the gas industry contenders are seen capitalizing on this demand for nitrogen products in oil and gas services in recent years as liquid nitrogen is extensively used in well stimulation, pressure testing, drill stem testing, coil tubing operations and cleaning and jetting. Aided by its abundance of properties, the product finds scope across a plethora of expansive industries ranging from glass making to electronics manufacturing, as they all rely on nitrogen in some capacity or the other. As per Global Market Insights, Inc., the overall liquid nitrogen market is expected to collect a revenue of USD 17 billion by 2025. This entry was posted in Bulk & Specialty Chemicals and tagged Automotive, Bulk Liquid, Chemical, Food & Beverages, Global Liquid Nitrogen Market, Healthcare, Liquid Nitrogen Market, Liquid Nitrogen Market Size, Liquid Nitrogen Market Trends, Metal Fabrication, Oil & Gas, On-Site Production, Packaged, Pharmaceutical, plastic, Rubber, Transportation. Additive manufacturing technologies over the past years have made a strong case in product innovation and 3D printing in automotive market, in particular, has significantly transformed the potential ways in which products are designed, manufactured, and distributed. The additive manufacturing techniques have also opened doors for lighter, cleaner, and more safe products with comparatively lower cost and shorter lead time. Quite overtly, these physiognomies have paved a lucrative way for the commercialization matrix of automotive 3D printing market, which has already chronicled its name in the coveted billion-dollar fraternity in 2017. According to a report by Global Market Insights, Inc., the global 3D printing in automotive market was estimated at over USD 1.4 billion in 2017, while registering annual sales of 3D printers over 110 thousand units. Given the proliferating 3D printers sale in the automotive sector, it has been identified that accelerating production is the highest priority the auto companies are relying on 3D printing for, climbing from 29% in 2017 to 39% in 2018. Auto manufacturers are increasingly relying on 3D printing to streamline and expand their possibilities of mass customization, build-to-order product strategies, and in increasing the production flexibility and sales. While there is no doubt that additive manufacturing has taken the automotive industry by storm, it would to interesting to take note of some industry magnates who are leveraging the technical trajectory of AM in driving their revenue growth. Enumerated below are few recent instances that shed light on the increasing adoption of 3D printing in automotive industry. Automotive industry behemoth Volkswagen has recently announced that it will be using the latest 3D printing technology for manufacturing different auto parts. The company will be using the technology with the HP Metal Jet process that is expected to simplify and speed up the metallic 3D printing. According to reports, a Volkswagen vehicle is manufactured from around 6000 to 8000 different parts and 3D printing has helped immensely in mass production of these parts. Volkswagen with HP and GKN, is further planning to take the technology to next level that could be able to produce individualized design parts including gear knobs, tailgate lettering, and special keys with personalized lettering without a great deal of effort. Significantly reducing the time required for manufacturing parts and assisting in production of mass quantities, the automotive 3D printing market demand is expected to thrive several notches up in the ensuing years. An advanced materials company, Nanosteel has recently unveiled that it has launched an enterprise focusing chiefly on materials for additive manufacturing. The new corporation, dubbed as the Formetrix, is expected to further the commercialization of 3D printing metals and as well offer on-demand production services. It has been reported that Nanosteel will be supporting two areas – steel powders and sheet steel for automotive lightweighting for 3D printing. This has grabbed the attention of several automotive 3D printing industry players for investment & development of their metal auto parts. Besides the automotive 3D printing industry, the company will be playing a key role in additive manufacturing components of the oil & gas, construction, and heavy machinery markets. This German auto maker has recently announced that it has adopted the Stratasys’ J750 full-color and multi-material 3D printer for accelerating the design verification process and reducing the time required for prototyping. Leveraging the additive manufacturing technology, Audi claims that it has accomplished prototyping lead time cuts by as much as 50% for some parts. According to reliable reports, prototyping & tooling application accounted for 60% of automotive 3D printing industry share in 2017, and Audi’s adoption of Stratasys 3D printing bears testimony to the rapid expansion of this segment. With increasing number of big-name manufacturers embracing 3D printing in automotive industry, it wouldn’t be wrong to say that this technology has come a long way and has the power to influence the direction in which auto design sector will head in future. Considering the sheer size of the global automotive industry, 3D printing is all set to be a game-changer in shaping automotive design and manufacturing trends. 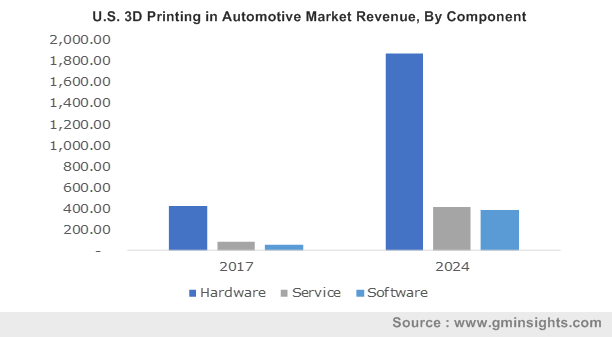 Soon to become an integral part, 3D printing in automotive market is poised to further unlock tremendous innovation potential and gather a remuneration portfolio exceeding USD 8 billion by 2024. This entry was posted in Sustainable & Smart Technologies and tagged 3D Printing in Automotive Market, 3D Printing in Automotive Sector, Ceramic, Desktop, Direct Metal Laser Sintering, DMLS, EBM, Electron Beam Melting, FDM, Fused Deposition Modeling, Hardware, Industrial, Manufacturing, Material, Metal, plastic, Printer, Prototyping & Tooling, Research & Development, Selective Laser Melting, Selective Laser Sintering, Services, SLA, SLM, SLS, Software, Stereolithography. Considering the increasing inclination toward integrating automation in a majority of the industrial domains, North America precision gearbox market is forecast to carve a profitable roadmap in the coming years. Despite the fact that gearbox technology has always been quite a popular name among manufacturing units since a while, the commercialization of North America precision gearbox industry has gained a remarkable momentum lately. Undoubtedly, technological affluences in major countries like U.S. and Canada has added an extra market value to these gearboxes in terms of reliability and accuracy. Companies involved in the industry are readily adopting long-term supply agreements to maintain the overall product demand, which at the same time would reduce the cost involved in the value chain. This, in effect, is sure to reflect in North America precision gearbox industry share in the coming years, having held a valuation of USD 371 million in 2016. Speaking of competitive profiling, companies involved in North America precision gearbox market have been increasingly adopting some of the conventionally effective growth strategies, product differentiation being at the pinnacle. The recent partnership of Pinion Inc., and Gates Corp. to officially launch low maintenance bicycle precision gearboxes in North America is a validation to the aforementioned fact. As claimed by the company officials, Pinion is planning to opt for low maintenance shifting technology to enable comfortable easy bike rides. Citing another instance, EXSYS Tool Incorporation, another leading name in North America precision gearbox industry has recently enhanced its product portfolio with the launch of a novel type of high-quality EPPINGER gearbox. Reportedly, these new HT-type hypoid gearboxes feature robust and compact designs, suitable for a variety of dynamic and specific solutions. With many other leading giants likely to follow the trend, North America precision gearbox industry is expected to chart out remarkable growth over 2017-2024. Boasting a wide application matrix including healthcare, automotive, agriculture & construction, E-mobility, material handling, façade technology etc., North America precision gearbox market size is forecast to exceed a valuation of 556 million by the end 2024. Automotive applications recorded a remarkable revenue of over USD 122 million in 2016, and is expected to drive the application matrix over 2016-2024. 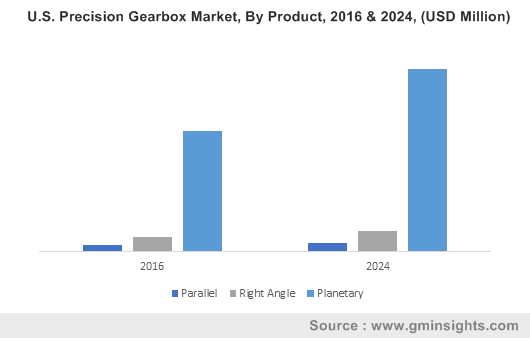 The expanding automotive sector along with growing popularity of electric vehicles that demands optimum power and energy is sure to upscale North America precision gearbox market penetration. U.S., having pegged the title of a major revenue contributor for North America precision gearbox market share, accounted for almost USD 332 million in 2016. Stringent regulatory guidelines set by the American National Standards Institute with regards to robotic application, transportation, and packaging are expected to boost the product penetration in U.S. over the coming years. The proliferating food and beverage sector is another important determinant that is expected to catalyze the regional growth, given the relentless innovations in food packaging technology and the growing investments in the developments of food production facilities. As per estimates, overall food and beverage applications is expected to witness a substantial y-o-y growth of 6% over 2017-2024. Having recorded enormous developments in the sectors where the application scope of gearboxes is huge, U.S. alone is slated to cover 90% of North America precision gearbox industry. Advanced machinery, of late, has become a priority in most of the industrial sectors in North America. Integration of automation has raised the performance bar to great heights and has offered high potential in these industries, by ensuring a strong supply value chain. Technological breakthroughs over the years have further played a significant role in enhancing North America precision gearbox business industry size. As these gearboxes continue to meet a wide array of supply value challenges such as effective pricing and just-in-time delivery, North America precision gearbox market is foreseen to gain a remarkable traction over the ensuing years, with a target market size of 968.9 thousand units by 2017-2024. This entry was posted in Automotive & Transportation and tagged Aftermarket, Aluminium, Automotive, Brass, Bronze, Carbon Steel, Cast Iron, North America Precision Gearbox Market, North America Precision Gearbox Market Size, OEM, Parallel, Planetary, plastic, Precision Gearbox Market, Precision Gearbox Market in North America, Right Angle, U.S. Precision Gearbox Market. Hydrogen Engine Center’s recent launched intake manifold technology has marked a quantum leap in automotive air intake manifold market. This new design will apparently overcome the air & fuel imbalance in all the V8 engines, leading to reduced power and operational inefficiency. In addition, the technology is designed to improve the overall power output between 4% to 8% on almost all the internal combustion engines and can work on any type of combustion engine with four or more number of cylinders. The fact that this design will halt the backfiring of V8 engines with the usage of hydrogen as a fuel would certainly impel automotive air intake manifold market in the years to come. Recently, Ford India unleashed the 1.5-liter Ti-VCT, a three-cylinder petrol engine, that would open new growth avenues in India automotive air intake manifold industry. The manufacturing unit of the firm based in Sanand, Gujarat will manufacture this innovative petrol engine that will fulfill the demands of both the regional and global automobile sector, as it offers enhanced fuel efficiency and helps reduce the carbon emissions in the environment. Key automobile manufacturers have been striving to expand their production base lately, given the intense competition and product demand. Holley Performance Products Incorporation, for instance, has established a manufacturing unit at Franklin in the U.S, which is likely to augment the vehicle production and increase the number of jobs across the automotive sector. The numerous developments underlining the automotive domain and automotive aftermarket have led experts to predict that automotive air intake manifold market will indeed experience lucrative growth prospects over 2017-2024. The substantial rise in the demand for vehicles across Indonesia, China, and India has led to an improvement in the vehicle production capacity, which would certainly augment APAC automotive air intake manifold industry. 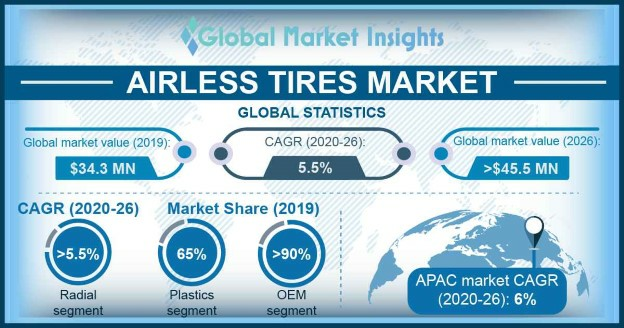 Furthermore, APAC has been predicted to contribute over 45% toward global automotive air intake manifold market revenue by 2024, driven by the ever-expanding automotive sector in the region. Germany on the other hand, houses some of largest automobile manufacturing firms such as Volkswagen, Audi, Mercedes Benz, and BMW, which would considerably stimulate Germany automotive air intake manifold market. In addition, escalating demand for passenger cars across the region, resulting in an increase in the vehicle production will further augment the regional growth. Reputed players such as MAHLE Gmbh, Aisin Seiki Company Limited, Keihin Corporation, Röchling Group, Mikuni Corporation, and Sogefi S.p.A partaking in automotive air intake manifold industry share have been focusing on expanding their consumer base and brand visibility across myriad geographies. Citing an instance, in the second quarter of 2017, Rochling Group commissioned its first automobile manufacturing plant in Mexico. Favorable trade policies and the prevalence of effective product distribution channels have also considerably augmented this business space. Manufacturers have lately been adopting just-in-time strategies that has resulted in high product penetration across the automotive sector, thereby stimulating automotive air intake manifold industry. 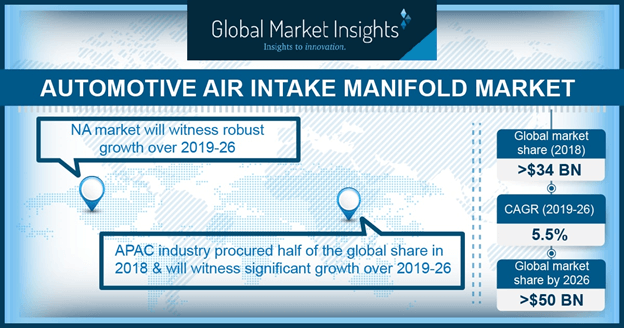 As per Global Market Insights, Inc., automotive air intake manifold market will cross a targeted revenue margin of USD 51 billion by 2024. This entry was posted in Automotive & Transportation and tagged Aftermarket, Aluminum, Automotive Air Intake Manifold Market, Automotive Air Intake Manifold Market Size, Automotive Air Intake Manifold Market Trends, Automotive Air Intake Manifold Market Value, Casting, composites, Dual Plane, EFI, Heavy Commercial Vehicles, HI-RAM, Injection molding, Iron, Light Commercial vehicles, Magnesium, OEM, Passenger Vehicles, plastic, Single Plane, Sportscar, Supercharger. The commercialization potential of Aluminum Pigments Market is quite evident from the growing number of strategic partnerships outlining the competitive terrain. Recently, Nexeo Solutions Inc., a giant in the chemicals & plastic distribution industry has entered into a corporate partnership with Silberline Manufacturing Company Inc., a global supplier of high quality aluminum pigments. As per market experts, this strategic move is expected to strengthen the business position of both the firms in the overall aluminum pigments industry with a better value chain and an expanded product portfolio. Such strategic acquisitions and expansions are quite common in aluminum pigments market to address the increasing product demand from varied end use industries like automotive, construction, and paints & coatings. The latest trend of aesthetically designed customized vehicles with lustrous paints is expected to stimulate aluminum pigments market valuation, which is forecast to exceed USD 580 million by 2024, with a projected CAGR of 6.5% over 2016-2024. In the automotive paints and protective coatings, aluminum pigments are primarily used to improve the appearance of the vehicle. As per statistics, overall paints & coatings is one of the prominent end-use application of aluminum pigments market and accounted for more than 40% of the overall industry share. Other than the automotive industry, plastic is another prominent end-use segment further catalyzing the growth of aluminum pigment industry. As per the estimates, aluminum pigments market share from plastic applications is projected to record an annual growth rate of 6% over 2017-2024. Speaking of the geographical trends, Asia Pacific is one lucrative belt where the aluminum pigments market demand is notably high from automotive applications. Asia Pacific aluminum pigments industry having had a revenue of USD 120 million in 2016, is slated to collect substantial revenue with an annual growth rate of above 7% over the coming seven years. The attributing factor toward the regional growth is the surging use of the printing inks for the advertisements and magazines. Aluminum pigments are widely used in printing inks to give metallic effect to labels, leather, films, packaging materials, and brochures. The use of leafing grade products gives printing inks a lustrous and brilliant effect. These grades also increase the brightness and impart a glossy finish to the surface, thereby making it applicable to the cosmetics industry. 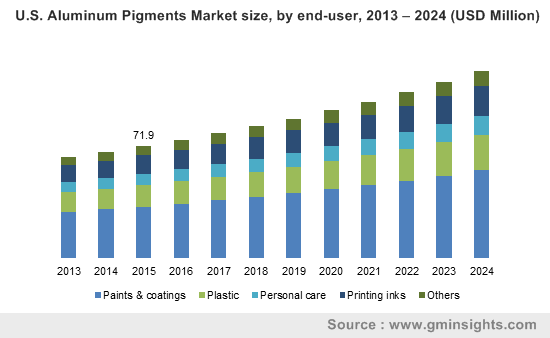 The personal care application segment within aluminum pigments market is anticipated one of the fast-growing segment at a CAGR of 6.5% over 2017-2024. Rising demand for personal care and cosmetics products, particularly in Asia Pacific has fueled aluminum pigment market demand. On account of the escalating cosmetic sector expansion, North America is further estimated to witness a substantial growth trend in the coming time frame. Global Market Insights, Inc. projects North America aluminum pigments industry to surpass a valuation of USD 130 million by 2024. In 2016, the industry space was quite consolidated with the top four participants – Altana, Carl Schlenk, Silberline, and Carlfors Brukhaving, having shared more than 30% of the overall business fraternity. The other prominent names in this industry include Toyal America, Inc., Alba Aluminiu, Zhangqiu Metallic Pigment Co., Ltd., Metaflake Ltd., and Sun Chemical. This entry was posted in Bulk & Specialty Chemicals and tagged Aluminum Pigments, Aluminum Pigments Market, Aluminum Pigments Market Analysis, Aluminum Pigments Market Forecast, Aluminum Pigments Market Future, Aluminum Pigments Market Growth, Aluminum Pigments Market Outlook, Aluminum Pigments Market PDF, Aluminum Pigments Market Report, Aluminum Pigments Market Share, Aluminum Pigments Market Size, Aluminum Pigments Market Trends, Aluminum Pigments Market Update, Paints & Coatings, Personal Care, plastic, Printing Inks.